Great challenges abound within the mission of creating disruptive software in the healthcare space due to the size and complexity of healthcare itself. The MedFuse approach is to bring together people – technologists and folks interested in niche software and device methods – along with people across the healing arts spectrum to solve some of the most challenging health problems. Opportunities for the software developers, creators, engineers and the doctors, nurses and other practitioners to have constructive, problem-solving conversations have become fewer and fewer as the healthcare industry has consolidated over time. Our aim is to create a space where ripe, “primordial soup” conditions occur because we believe that is the best recipe for explosive innovation. Silicon Valley’s philosophy of disruptive software innovation can be more difficult to apply to healthcare than in the digital world – as evidenced by recent startup trainwreck Theranos (an essentially fraudulent blood testing and diagnosis company which was valued in the billions and is now worthless) and possible trainwreck Zenefits (a health insurance software company valued in the billions which recently has had to lay off over half of its workforce). The consistent “improper force fitting” of web and software business models is largely due to healthcare’s complexity. Wide-ranging problems and regulations which make repeatable software models less scalable, but at the same time opens up wide opportunities for niche software companies to make a big impact. For any aspiring health-focused software entrepreneur, the best starting place for harvesting ideas and potential business is to go where the problems themselves are housed – the doctors, healthcare practitioners, and healthcare executives. The concept of MedFuse is to bring together healthcare innovators along with those in the healing arts to have constructive and collaborative conversations to help solve some of the most challenging health problems that our country faces today. Minnesota, being the center of both healthcare technology and many other cutting-edge technologies, particularly at the intersection of connected devices and data, is a ripe place to discover and come up with innovations with consequence. Utilizing advances in software, Distributed Health, and more specifically remote medical testing is seeing explosive growth in the last 5 years. Historically, medical testing has been exclusively done in a lab, with large machinery and operating by highly trained professionals. This model works moderately well for patients that are centrally located and/or with easy access to a clinic. However, it has proven to be an expensive model that can become cost-prohibitive to best care practices. With advances in at-home and distributed tests (often integrated with some device e.g. iPhone or in-home sensor), there is a gigantic opportunity to drastically reduce the cost and ease-of-access to rapid testing. While there are multiple boundaries to the development, approval, and billing of these tests, there are multiple pathways currently being developed to reduce the resistance to innovation. Wide opportunities also exist within both connected devices and pure cloud-based Home Healthcare software, which are segments of the Home Healthcare industry, which is an entire industry within healthcare itself. Registered Nurses, Physical Therapists, Occupational Therapists, Home Health Aides, and Medical Social Workers can provide home health care service for adults and seniors, post-hospital stay. Ostensibly, the goal of home health care software is to coordinate operations and processes, like scheduling appointments, coordinating caretakers and patients, and documenting health records and visits to be able to create more transparency and adherence to regulation, as well as opportunities to create intelligent software which matches the right type of care with the right patient. There is a wide range of new opportunities within the Home Healthcare Software field, particularly taking into account connected devices and sensor-ized care. 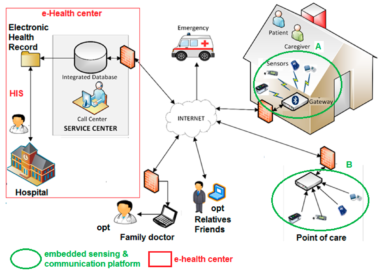 With Smart Home enabled communication and treatment, as discussed widely within healthcare technology, complexities and scalability issues abound, and so one of the key ways of discovering problems is to actually interact with the healthcare practitioners themselves. That’s why the main goal of MedFuse is to actually physically bring together healthcare practitioners and technologists – so that they can collaboratively discuss and understand each other’s problem sets, and innovate better solutions. Distributed and Home Healthcare has to the potential to revolutionize the way that patients interact with their doctors and take increased ownership of their health, ultimately improving the health and wellness of all involved. The starting point for improving outcome for people always begins with a great idea, which leads to the development of a device, treatment, or therapy. However, without the adoption of the idea by health insurance providers, it becomes very difficult to utilize said innovations. While the ever-changing political landscape surrounding health insurance remains highly volatile, private companies have been making inroads to modernizing and improving coverage. The Big Tech Giants have begun to approach healthcare differently since early 2018 by simply providing financing methods to ensure groups of their own employees, creating new insurance companies, subverting the traditional insurance industry comprised of such local companies as UnitedHealth Group and Blue Cross and Blue Shield. There has also been significant interest and coverage in online delivery methods for pharmaceuticals, particularly from Amazon. At the same time, there is a constant churn of speculation that larger tech companies, though having been extremely successful over the past couple decades, may run into huge challenges due to the complexity and size of healthcare problems. Taking a MedFuse-based perspective we can take a look at perspectives from both software developers and insurance providers and healthcare executives who really understand the problems and challenges intimately to understand where potential potholes lie, and what the best strategies may be. We believe that MedFuse serves a market that has great potential. We invite you to come out, take part and learn about the cutting-edge of medical innovation. Tickets are free for healing arts practitioners, so please pass along the message to those in your network that would like to attend. –What is Home Healthcare Software?